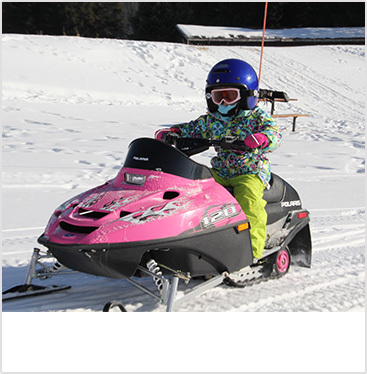 At Grand Adventures, you have the unique opportunity to choose from a wide variety of snowmobile activities (guided or unguided). We do everything possible to assure a safe and enjoyable experience. However, because of the inherent risk involved with this type of outdoor activity, your participation is “at your own risk”. We strongly recommend guided snowmobile activities for the beginner to intermediate riders and those with teenage drivers. For age minimums / restrictions and who can drive please review our Trip Info page. 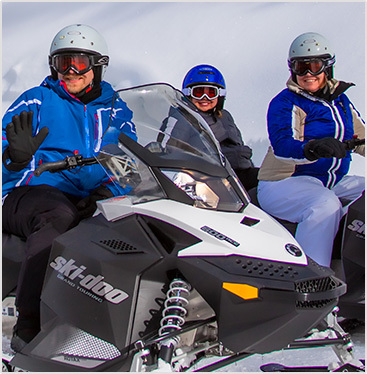 Our staff of professional guides customize each tour based upon the conditions and the group to “maximize” your snowmobiling and Colorado experience. Each of our guides is in radio or cell phone communication with our base facility. We typically assign no more than 8 machines to one guide. 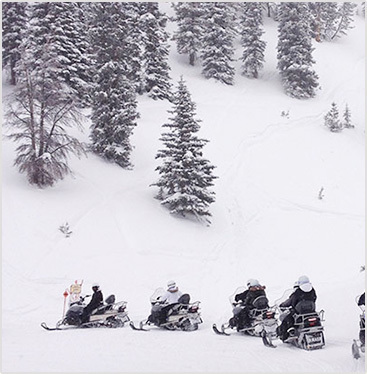 All our guides are fully trained in first aid, CPR and back country Snowmobiling expertise. Our guides have excellent understanding of the area. You’ll be in superior hands and will have a memorable experience. For the advanced snowmobile rider, our rentals and staff have the latest in mountain performance and luxurious touring sleds ready for you. We will cover machine operation, map orientation and safety tips with each group before your departure. Dress in layers. Bring ski wear, gloves, goggles (required) for eye protection. Also, neck gator, scarves and or face mask are nice to have on cold days. Boots and DOT certified helmets are provided free of charge. Dont forget a camera, sunscreen and bottled water. We do have some items for sale on site.